The Chalet See-Through wood fireplace has two sets of door openings. Construction of the doors consist of high temperature ceramic glass, with a lifetime warranty, gasketed to a rugged 22 pound door frame. The door latching system is double-pinned (top and bottom) for a long term tight seal. 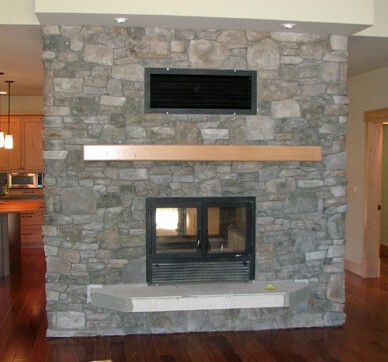 The Chalet Series Fireplace offers a 35” x 19” viewing area! It has up to 140,000 BTUs/hour, a burn time of up to 12 hours and has the capacity to heat up to 3,000 square feet! The air within your home enters into the bottom louvered vent. It becomes heated by the system, as well as the masonry chamber. Then the heated convection air rises up and circulates out the top heat vent.